Matter - everything that makes up me, you, planets and stars - appears to make up only a very small fraction of the universe, about 4%. Instead, the universe seems to be filled predominantly by a very strange material known as dark energy and it is this material, with it's anti-gravity properties, which seems to speeding up the expansion of our universe. We've known that the universe was expanding since Edwin Hubble made his observations in the 1920s, however it's only in the last 20 years that we've realised that this expansion is actually speeding up! The problem is that we can't directly detect dark energy and this makes it very difficult to understand what it is and whether it really does exist. Instead we must rely on indirect observations, looking at light travelling from the far reaches of the universe to determine whether the properties of this light has changed during the time it has taken to reach us. A good way to measure the expanding universe is to make observations of distant supernovae (huge explosions which follow the death of large stars) which act as 'standard candles' or 'lighthouses' because we know how bright these object should be. Measuring light from distant supernovae has allowed us to see that it is different to what it should be if these objects were positioned within a static universe. Instead what we see is changes in this light which indicates that these objects are being flung outwards and away from us via some sort of cosmic expansion. A nice analogy to describe the expansion of the universe is what happens when two points are drawn on the surface of an inflating balloon. As the balloon is inflated, the two points begin to move further and further away from each other and as the material expands outwards, the distance between the two points also increases. Applying this analogy to the cosmos, we could imagine the same happening with two galaxies being pulled apart from each other as the space they exist in expands. As dark energy is so difficult to detect, scientists have recently been looking for new ways to independently verify its presence within the universe. Whilst at the BBC I was lucky enough to interview cosmologist Dr Chris Blake from Swinburne University, Australia who has recently published two papers reconfirming dark energy via a new set of methods. Blake and his colleagues produced a galaxy map of over 200,000 galaxies and used this information to look at how these galaxies were distributed and how they grew relative to each other. Through this work Blake and his colleagues were able to reconfirm the presence of dark energy and perhaps most importantly were able to determine some of its properties. It probably sounds better with headphones (or obviously decent speakers). We had a great time playing our hand picked sounds of science at Dazed Live on Saturday - thanks to Chris from Super/Collider for inviting us on! The show has now been uploaded to Mixcloud so give it a listen! - also on the show is music from Bright Star Catalogue and interviews with the likes of Jay Cousins (buy this satellite) and Magnus Larsson ! In this Episode I visit Dr Kate Jones at the Zoological Society of London to find out about a bat call reference library they're developing called 'Echobank' which is being used in conjunction with the iBats monitoring program. 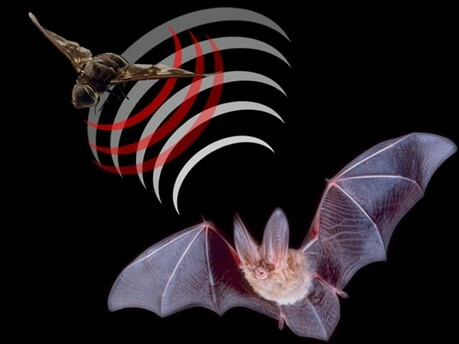 Scientists at the Zoological Society of London are using Echobank to teach a neural network to identify specific bat species from the acoustic properties of their calls. Although this may sound pretty niche, it's really cool stuff because the technology has much wider applications. Firstly the team are using it in combination with a smart phone app which can be used by anyone to take bat call recordings. In doing this the team hope to collect global distribution data for bat populations, which Dr Jones is hoping to use to determine whether bats can be used as a 'heart monitor' for the state of the environment. As bats represent one fifth of all mammalian species and exist in a huge range of habitats (from your local park to the tropics), changes in their global distribution could be used to monitor the impact of climate change on the natural world. In this episode I take a listen to the vOICe technology which has been developed to help the blind ‘see’ with sound. I'm joined by Dr Michael Proulx of Queen Mary University London who is currently using the vOICe technology to understand how different sense modalities interact to give rise to perception. Dr Proulx tells me how the vOICe technology can be used to induce a type of ‘synthetic vision’ and how this is achieved through the process of 'sensory substitution'. To find out more about how the software creates sound from visual information we put it to the test with the use of several interesting images (below). So if you ever wanted to know what a banana or even a goat might ‘sound’ like you’ve come to the right place! Or listen to this feature within episode 078 of Short Science. Through a process known as 'sonification' - data from the ATLAS experiment at CERN can be transformed into sound, providing an insight into what the elusive Higgs Boson may sound like.